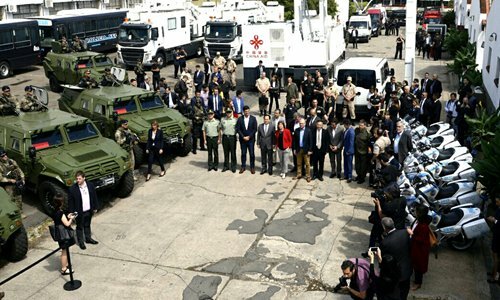 Argentina's Minister of Security Patricia Bullrich attends the presentation of security equipment to be used at the G20 Summit in Buenos Aires, Argentina on November 16. China expects the upcoming G20 summit to send a clear signal on supporting the multilateral trade system, reiterate the common position of opposing trade protectionism and together build an open global economy, China's Ministry of Foreign Affairs said Friday. Assistant Foreign Minister Zhang Jun said Friday that the global economy faces multiple risks and downward pressure, including from fiercer protectionism and unilateralism, so the international community places a high value on the G20 summit, and expects it will contribute to a strong, sustained, balanced and inclusive world economy. Zhang was speaking at a media briefing on Chinese President Xi Jinping's upcoming trip to the G20 in Argentina. Xi will pay state visits to Spain, Argentina, Panama and Portugal from November 27 to December 5, and attend the 13th Group of 20 (G20) summit from November 30 to December 1 in Buenos Aires, Argentina, Foreign Ministry spokesperson Lu Kang announced Friday. China also expects the G20 summit will see strengthened cooperation on trade and investment and the ability to tap new growth drivers, Wang Shouwen, Vice Commerce Minister, said at the media briefing. "But the G20 is not the WTO, and cannot replace the WTO in decision-making. Certain discussions have to be conducted with the participation of WTO members and on the basis of consensus," Zhang said. Bai Ming, deputy director of the International Market Research Institute of China's Ministry of Commerce (MOFCOM), told the Global Times on Friday that the key for next week's G20 is what the path of globalization will look like in the future - whether it will be a win-win road marked by more cooperation or not. "On specific issues, reform of the WTO and the Sino-US trade dispute will top the agenda," Bai said. MOFCOM issued a document on China's position on WTO reform Friday, which states that China supports WTO reform and believes that reform should safeguard the core values of multilateral trade systems and guarantee the interests of members from developing countries. Wang said the WTO faced three major crises, which are a lack of Appellate Body members in its terminal resolution mechanism, abuse of the WTO security exception clause and ignorance of multilateral rules by some members. Bai blamed the US for the crisis, as it is only acting in its own interests but at the same time, is refusing to make any contribution. "The US only uses WTO clauses favorable to it, and refuses to recognize all the other clauses," Bai said. Because of the US, the G20 faces challenges in playing a coordinating role among all parties. Bai warned that G20 members may find it difficult to reach a joint statement at the conclusion of the summit, and that some important content, such as opposing unilateralism, may be excluded. The G20 summit has attracted worldwide attention because it is the first time that Xi will meet US counterpart Donald Trump since the Sino-US trade dispute started in earnest. Regarding the significance of the meeting, Wang said that trade officials from both countries have maintained close contact and have had constructive discussions on issues of common concern and each other's particular concerns. "We hope China and the US are able to resolve their problems based on mutual respect, benefits and honesty," Wang said. "The world expects the summit to be a turning point for China-US relations and see the trade friction eased, but this will require a lot more dialogue and negotiations," Bai said. Xi's visit to Panama, the first Chinese leader's visit since China and Panama established diplomatic ties in 2017, is a milestone for future development of bilateral relations, Qin Gang, Vice Foreign Minister, said at the media briefing. Xu Shicheng, a research fellow at the Chinese Academy of Social Sciences' Institute of Latin American Studies, told the Global Times that Xi's Panama visit will boost bilateral cooperation under the Belt and Road initiative (BRI). "Bilateral relations witnessed rapid development just a year after the two countries established ties. Panama was the first Latin American country to join the BRI," Xu said. Xu said that the deepened cooperation with Panama shows that the BRI is open to the entire world. Varela will sign about 20 agreements in fields such as commerce, technology and infrastructure during the "unprecedented visit" on December 2-3, the Panamanian presidency said in a statement on Thursday, Reuters reported.